DOVER – The Division of Public Health (DPH) invites parents with children from birth to 5 years old to participate in its first Books, Balls and Blocks event, which will take place from 1:00 to 4:00 p.m., Saturday, October 13, at the Route 9 Library and Innovation Center in New Castle, Delaware. Presented in partnership with DPH’s Early Childhood Comprehensive Systems program, Help Me Grow Delaware, United Way, Delaware 211, the Delaware Division of Libraries, and New Castle County Public Libraries, the event is fun, educational and free. Parents should plan to stay for the duration. While children engage in games and activities at six different stations, parents learn how these interactions help stimulate their child’s healthy development. While the children are playing, parents will complete the Ages and Stages Questionnaire (ASQ-3). The ASQ-3 is a reliable, valid, and easy-to-use tool recommended to screen young children for developmental delays. Originally created by Help Me Grow Utah, the Books, Balls and Blocks model is a fun and educational way to provide developmental screenings to children within the first five years of life. The model provides opportunities for families to engage with their children through a variety of play-based activities that promote child development in areas such as early literacy, fine motor skills, gross motor skills and social skills. It also provides families with the resources they need to monitor their children as they meet developmental milestones and how they can get help if they have questions or concerns. • Appears to be on schedule. • Needs to be monitored and the child provided with learning activities. • Requires further assessment by a professional. Parents will receive child development resources, new fun playtime activity ideas and a goodie bag. Other community resources will be on site. Why should children be screened? • To understand what milestones your children can and should be reaching as they grow. • To be able to better identify your children’s strengths. • To give you ways to talk to your doctor or other professionals about your concerns with your children. • To track your children’s progress over time – a simple way to “journal” their milestone achievement. • To give you new ideas to use in play with your children and make this time more useful in their development. What is a developmental screener? • A tool that has been tested by researchers to ensure that it is measuring developmental milestones seen in all children as they grow. • Questionnaires meant to be used by all parents and providers to monitor children as they grow. • A tool to capture patterns of development in children early, helping increase better outcomes for later life, if action is taken. What is the Ages & Stages Questionnaire? • Help Me Grow Delaware uses the Ages & Stages Questionnaire (ASQ) for general development and social-emotional screening. • It is to be completed by the parent; parents are the experts of their children. 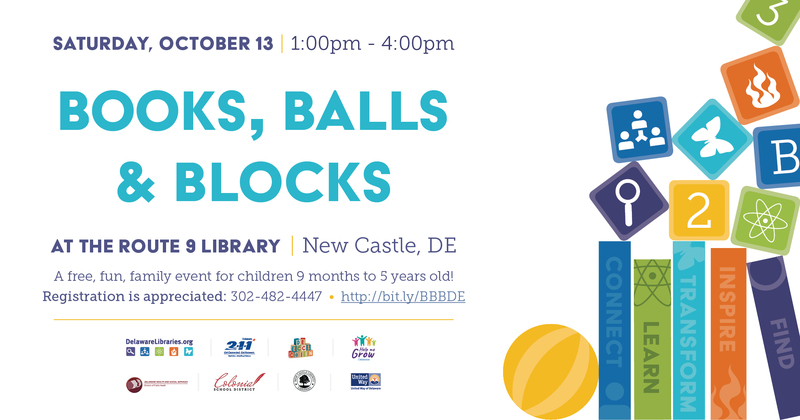 For more information about the Books, Balls and Blocks event, call 302-740-8447 or visit http://dethrives.com/events/event/books-balls-blocks.